There are currently three major areas of public outreach supported by MRO staff. The first is public star parties at the Etscorn Campus Observatory. 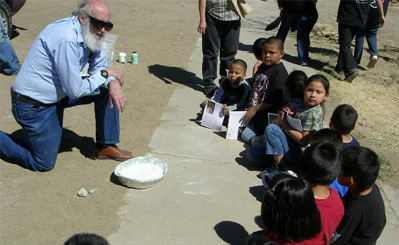 School and youth groups regularly attend star parties hosted by Dr. Daniel A. Klinglesmith and the New Mexico Tech Astronomy Club. These events provide timely information about, and real-time viewing of current, astronomical events; like meteor showers, and close approaches of the planets. The second area of public outreach is through astronomer mentoring for middle school and high school teachers by MRO scientists within Project Astro. Mentoring has to take place in Socorro schools and Laguna Pueblo school system. The third area of public outreach is the presentation of classroom demonstrations of astronomical concepts and remote star parties. Numerous classroom and portable planetarium presentations have been made for the Gallup-Mckinley school system and for the Dulce School system. If you are interested in having a star party hosted or having class presentations in your school please visit our Request A Star Party page.